Upon arrival in Buenos Aires, you are met and transferred to our centrally located hotel. The remainder of the day is free to explore the city of Buenos Aires. In the evening, we have our introductory meeting and dinner. Today, we discover the highlights of Buenos Aires. Traveling by bus and walking through the unique "barrios", we have a close look at daily life in Buenos Aires. We see Parliament Square, Mayo Avenue, Tortoni Cafe, La Boca, Recoleta and the ornate cemetery where Eva Peron is buried. Enjoy a traditional dinner while watching a fantastic tango show. In the morning, we transfer to the airport for our flight to El Calafate. Upon landing in Patagonia, we transfer to ground transportation and drive across the steppe to El Chalten, our staging point for the Fitz Roy Peaks in the southern Andes, and our hikes in the region. The drive takes us across semi-arid steppes as we approach the famous peaks of the Patagonian Andes. Today is our first hike in Patagonia. We will walk through a less visited area of the Glacier National Park, north of Mt. Fitz Roy. On a splendid day, we get good views of the famous mountain and the surrounding massif. Our trail takes us through old lenga forest (tall deciduous southern beech trees) along the River Eléctrico until we reach a small campsite. The distance until the Piedra del Fraile campsite (1800 ft/540 m altitude) is about 4 miles/6.5 km. People that want to traverse the Southern Patagonian Icefield take the same trail to get to the entrance (Marconi Pass). Avid hikers can go further to the Eléctrico Lake (1.5miles/2.5km) or continue to the Pollone Glacier viewpoint (1 mile/2 km further (altitude: 2400ft/725 m;). The same trail takes us back to our lodge. Today, we spend a full day trekking to Mt. Fitz Roy. 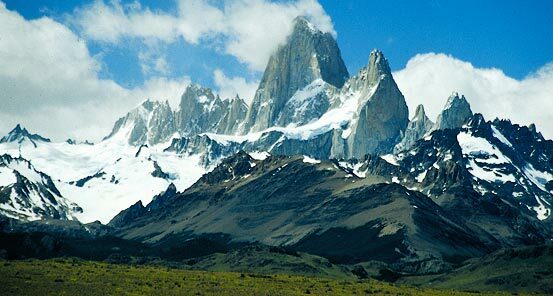 Mt Fitz Roy sits in its granite glory surrounded by Poincenot and Mermoz peaks. Enroute, we pass through Nothofagus forest and see glaciers. As we travel alongside the Rio Blanco (White River), the sounds of the rushing water echo off the mountainsides. Keep a watch for the world's second largest bird, the Andean condor, circling the peaks. 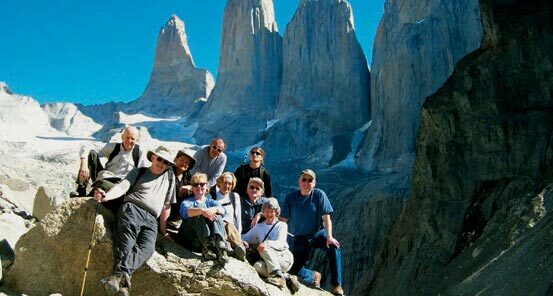 Note: For those who are keen for more adventure and a spectacular view of the upper lakes of Laguna Sucia and Lago de los Tres, a challenging hike from the Fitz Roy base camp is offered. 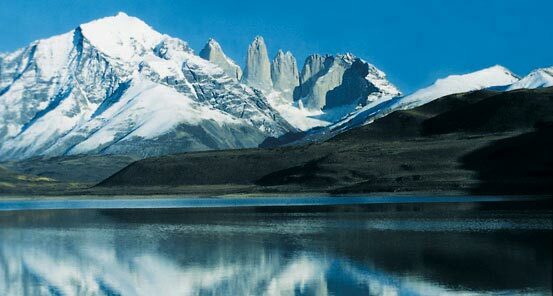 In the morning, we hike to a viewpoint where we can see the magnificent Cerro Torre and Fitz Roy Peak. For those keen to walk further, a spectacular hike takes us to Laguna de los Tres for a panoramic view of the lake, glaciers and the principle peaks of the southern Fitz Roy Range. Enroute, we hike past a gorge, the towering peaks of the Andes, and alongside the glacial waters of the Fitz Roy River. Driving from El Chalten in the Los Glaciares National Park, we travel south through the steppe to reach the Andean Patagonian forest and mountain scenery filled with glaciers and lakes. Enroute to our Eco Camp, we will enjoy a short hike where we shall enjoy our picnic lunch and the wonderful views. This afternoon, we make our way to the Adventure Domes Eco Camp, with an optional hike through the surroundings. You will have time to settle into our metal triangular frame "geodesic dome tents" - each one 12 feet in diameter with standard twin beds and wood floors. There is even a big window at floor level so you can enjoy nature from the warmth of your comfortable bed! Washrooms and showers with heated water are a short walk away, as is our lounge/dining dome. Dinner is prepared over outdoor grills and is accompanied by local Argentinean wines. Tonight we fall asleep to the sounds of nature. Overnight at the Eco Camp. The Eco Camp is located in front of Perito Moreno Glacier, in "Peninsula de las Colonias". After breakfast, we start a full day of trekking to explore this peninsula, located between Roca Lake and the Rico branch of Lago Argentino Lake. The peninsula is named in honor of the first inhabitants of the area. 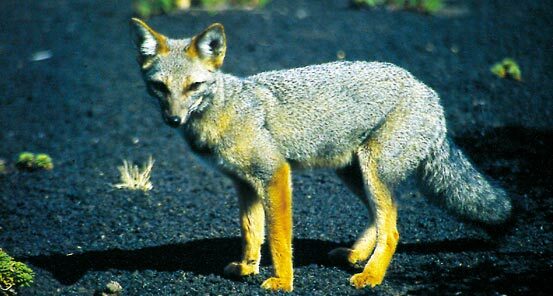 Here we will find the most representative native flora and fauna species of this area. Walking through it, we can easily enjoy the characteristic species of the Magallanic forest, Nothofagus Antarctica, Nothofagus Pumilio and in some isolated places N. Betuloides. During this trek, we may see condors. We will also appreciate the principle wall of Perito Moreno Glacier, that is just 12 kms from the Eco Camp. Except for the family that owns the land, no human can be found within 5 kms. After the excursion, we arrive at the Eco Camp to have dinner. We will leave the Eco Camp today and have a full-day excursion to the magnificent Perito Moreno Glacier, which is located within Glacier National Park and has been declared a World Heritage Site. The glacier is a river of ice, 2 miles wide, 20 miles long and 200 feet high, which we view from a tour boat only 500 feet away! It is considered to be one of the greatest natural attractions in all of South America. Hiking along the shore we can watch icebergs calving off the glacier into Lago Argentino. As we arrive at our nearby estancia, we can watch the kelpi dogs gathering the sheep. Dinner tonight is a wonderful feast with many local specialties. Our day is open to enjoy the activities of the estancia. Sheep-shearing and herding, a walk to the lake and bird watching by the lagoon. If you want more adventure you may wish to go further afield on a horseback-riding excursion. Tonight, another feast accompanied by the magnificent view over Lago Argentino and the Cordillera de Los Andes. Today, we have a long drive across the border into Chile. Enroute, we have lunch at a Patagonian estancia from where we can see the Paine Massif and the rolling steppe. In the afternoon, we arrive in the famous park of Torres del Paine, reputed to have the cleanest air in the world. We have a full day starting with a hike to Grey Lake adorned with icebergs from the calving glacier. We see Pehoe Lake, set amongst the Paine Massif and we walk to Salto Grande, a spectacular waterfall that empties into Pehoe Lake. 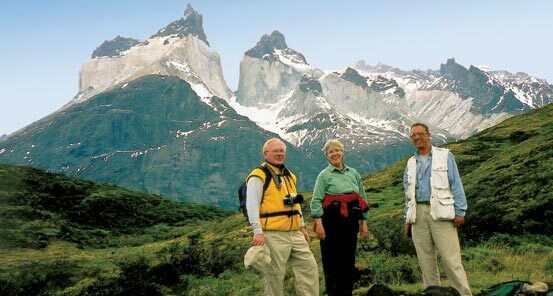 Today, we go on a spectacular hike to Torres del Paine. This is a challenging hike but well worth the effort because of the spectacular views of the Tower Peaks. The hike takes us up a slope with beautiful views of the countryside, through a valley and then up a moraine slope to see the Torres del Paine rising above a small glacier and lake. Torres del Paine translates to Blue Towers, in reference to the blue hue of the granite towers. This morning, we leave Torres del Paine and head south to Punta Arenas on the Strait of Magellan. This is a long trip through amazing scenery from the high mountains of Torres del Paine to the coastal city of Puerto Natales on the shore of Esperanza Bay. We will enjoy the fresh sea breeze in this busy port town and then continue for another 250kms through this mountainous Magallanes region of Chilean Patagonia. 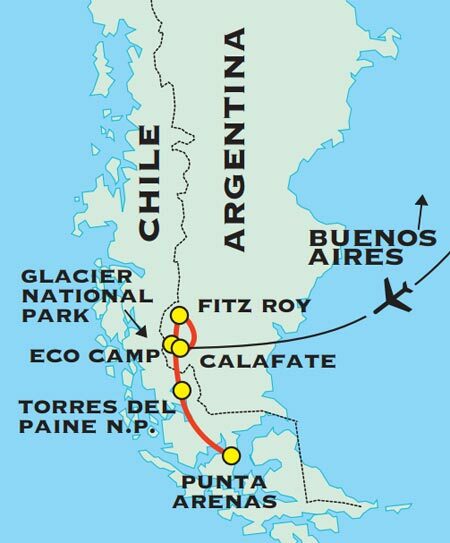 We will arrive in Punta Arenas late afternoon. Dinner and overnight in Punta Arenas. Returning to Punta Arenas, located on the Strait of Magellan, we will have time to explore the central plaza with its elaborate buildings reminding us of its wealth when wool and wood were king. Traces of its history as a staging ground for Antarctic adventures are evident and the city still has a strong maritime base. We will also visit the Sara Brown Museum where you will learn more about the history of this city. Tonight we recollect our Patagonia adventures at our farewell dinner. We transfer to the airport for our homeward flights or join our extension to mysterious Easter Island, the most remotely inhabited place on earth, Igauzu Falls or Machu Picchu. Some trips connect to our Antarctic expedition cruises departing from Ushuaia, Argentina.